7th March 2010, Sunday – A Briefing on the Special Olympics was held to inform parents, teachers and relatives of special kids to participate the special olympics. Among the attendees were teachers and students from Pusat Bahagia Tutong. To not be berated about participating the special kids to the Special Olympics, as this might be an opportunity for those kids to do things that other “normal” kids nor adults do. How some special kids had the opportunity to compete regionally as well as internationally. How participating might lead to other opportunities such as a previous special kid was invited to, and participated in climbing up Mount Kinabalu. 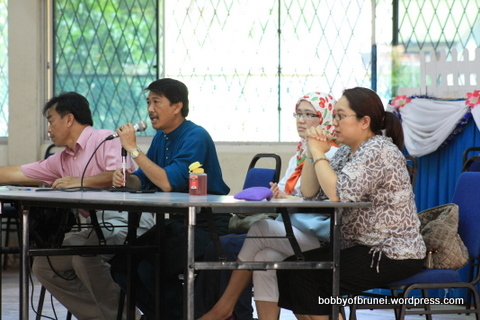 The speaker called more special kids in Tutong to represent, as previously there has only been 5. It was informed that Training for the special olympics will be held at Sekolah Menengah Berakas on Friday Morning starting from 12 March 2010. Any interested parent or guardian can send their special kids for training and apply for their kids to participate in the Special Olympics. Posted on 2010/03/12, in Event and tagged Brunei, Pusat Bahagia, Pusat Bahagia Tutong, Sekolah Menengah Muda Hashim Tutong, SMMH, SMMHT, Special Olympics, Training, Tutong. Bookmark the permalink. Leave a comment.